This post is sponsored by Stella and Dot. All opinions are my own. Sometimes all it takes is a little detailing to really amp up a basic piece. 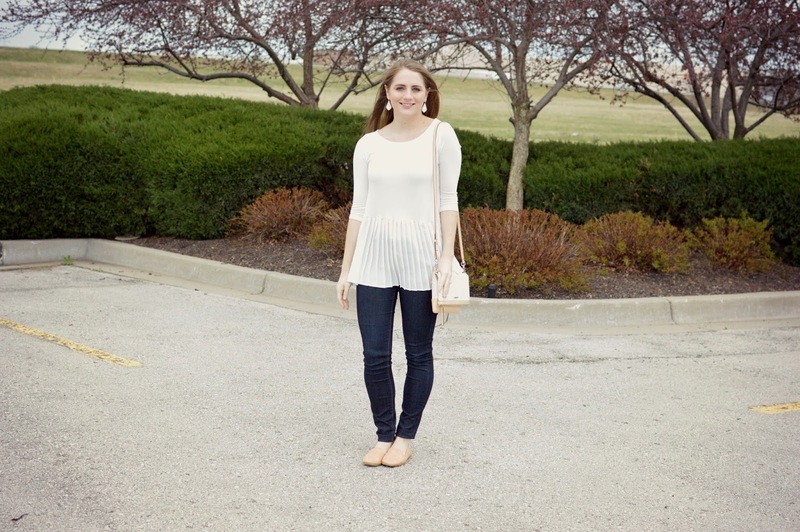 Take this white top I am wearing in today's post, for example. Without the chiffon peplum hem, it's just a regular ol' white top! I love finding pieces like this because they can really be worn so many ways, since it's essentially a glorified basic. I wanted to play up the springy vibe of this top, so I paired it with this new clutch which you may have just recently seen on my Instagram account. The woven detailing is perfect for spring, and I love that it has a removable strap so I can also wear it as a clutch! Love your top! You are sooo beautiful! this peplum top is so pretty. I love that top! So pretty and perfect for work or a night out on the weekend! Simple, classy and Spring Spectacular!! Gorgeous girl!! I love that the peplum is pleated! I don't think I've ever seen something similar before and it's a really neat take on it. love a peplum top that is a little longer. i have a longer torso so this would be perfect! and that bag is so cute - i love one you can wear multiple ways! Cute top! I really love that cross body bag, too! Love that peplum top on you and that cross body bag is so perfect for the Spring! Loving that top, especially against the dark jeans! I love puplum tops but my hips are just too big for them! So I will just lust after all the cute ones I see on others! Adorable outfit-I love basic outfits! Happy Monday! I love the detail of that top and it's so flattering on you!!! It's perfect with those jeans!! Love your top!! It's so fantastic. Such a cute and fun outfit. The top is too cute. and love the white on white. The pleated peplum really elevates the whole look! What a feminine and delicate piece! Gorgeous! I love that pretty peplum! So fun! I didn't know Stella & Dot made clothing! Such a great closet staple! Lovely look! So soft and fem! Love it! 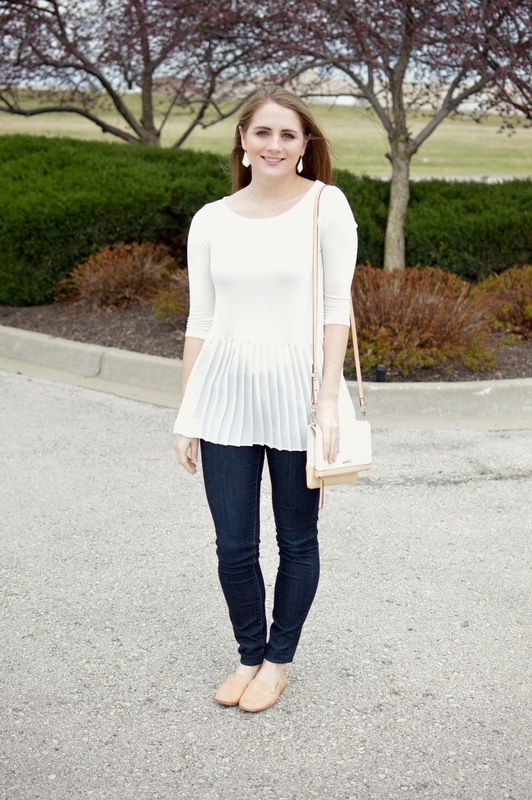 Such a pretty peplum top & I love white in the spring! You can never have too many white tops in my opinion! Love this top! So cute and girly...and the bag is adorable! That white top really is so cute - I love that it can be dressed up or down! Stella and Dot seriously has some of the cutest items! That crossbody is so cute, and perfect for Spring! I also love how it has a pop of color! That is a very cute top! My sister had one similar this weekend when we hung out and it's adorable! She threw a cardi over hers! Love the top!!!! So cute!! I really love that top, the pleats are so unique and fun! I love peplum tops, and that crossbody clutch is so versatile! Agreed- the peplum totally upgraded this top! Love how classic and chic it is! Very pretty! Such a fresh look for spring! I love the flare that shirts has on the bottom half and the purse is super cute! So pretty! Obsessed with this peplum top! Love that it is flowy too! what a pretty top and i love how the clutch matches the shoes!! Your peplum top is so pretty! Love the pleating detail! I love your peplum top! but I'm drooling over that bag. I hope I win hahaha. by the way I'm glad I found your blog, I always check your instagram but I don't know why I had never visited your blog, is just as cute as your ig feed! What a great spring look! I love the peplum always! Such a gorgeous bag!! and I love that top on you! love your pleats! that trend is so hot right now! Looking gorgeous! Love your white top. Happy Tuesday! That is such a perfect top! I love the pleats!! Absolutely adorable!!! I love looks like this - super easy but so so chic. It's perfect!!! Pretty!! I love the layers of this top. Peplum tops are always a favorite of mine! They really flatter every body type and you are no exception. You look fabulous! So springy! This peplum top is so pretty!! I love the pleated detail is adds such an impact to an otherwise basic piece! Loving this top, lady! The peplum is so different than on most of these kind of tops and that's a good thing. It's super flattering! that top is so pretty!! I am also lovinggg that bag! That is such a pretty top - and the pleated peplum is so fun. That top looks great on you Darcy. I saw a similar top in red! With white you can wear it with so many things. What a cute crossbody! And it looks like a great, go-with-everything neutral for Spring! Absolutely loving this outfit - the white top is so pretty!!! So cute!! Love the bag!! It's definitely a cute top. I need one of these in my wardrobe. I love this top! The pleated peplum is so cute! Beautiful top!! and Obsessed with your cross body! What a great top! I love that the peplum is pleated and long!! This top is so gorgeous - I love that it is pleated too. This is such a gorgeous top! You look so great in it! Thanks for the giveaway! Beautiful top, absolutely love it! Such a pretty top - you look so springy! Thanks so much for linking up with Style Perspectives today! Oh, in love with this look! I am a sucker for all things peplum!